(CN) – In a battle of Nature vs. Netflix, the internet maybe winning, as cellphone towers propagate around the country in the last frontier of cell coverage: national parks and national forests. A complaint filed this week with the Interior Department’s Office of Inspector General claims national parks across the United States are allowing cell coverage to spread into wild backcountry areas without public involvement, without getting paid and sometimes without knowing who owns the towers. Public Employees for Environmental Responsibility (PEER) said in its Oct. 30 letter to Mary Kendall, deputy inspector general for the U.S. Department of Interior, that Yosemite National Park is the latest national park in America to allow cellphone towers to be built without adequate government or public oversight. “Not only is this a helluva way to run a railroad, but Yosemite does not even know who owns the trains,” Jeff Ruch, executive director of PEER, said. He said there’s a tendency of many national park superintendents to “ensure every square inch of their park has a strong 4G signal, thus creating conflict between connectivity and serenity in remote corners of wired parks. Clinton’s memorandum of Aug. 10, 1995, titled “Facilitating Access to Federal Property for the Siting of Mobile Services,” directed federal agencies to develop access to federal property for the siting of mobile telecommunications equipment. Construction of telecommunications service on public lands can also lead to local spending on infrastructure. In Montana, an obscure gravel mountain road leading to the small ski area of Blacktail Mountain, is being paved by federal and county governments – all 13 miles to the summit, where telecommunications equipment is proliferating. The 7,200-foot mountain provides easy access for telecommunications equipment that can broadcast signals in a rapidly growing area next to Glacier National Park. Using a rate schedule from 1996, the federal government charges rent to cell service providers for placing their equipment on federal land. The rates are based on the population base that the telecom equipment serves. For rural areas of less than 50,000 people, the rate is about $4,000 annually. For major urban areas of 1 million to 2.5 million people, the annual lease fee is about $13,000, and it goes as high as $19,000 annually for sites that serve 5 million or more people. The Forest Service does not pay for maintenance of the facilities, and the only cost to the government is in the application and monitoring process according to Babette Anderson, national press officer for the U.S. Forest Service. There is little central oversight of cell tower development in national parks and national forests. Each national park or national forest is allowed to make its own decisions and recommendations of cell tower providers and equipment. In order to avoid adding towers where towers already exist, the Forest Service works to co-locate new facilities on the existing network of about 1,500 towers, Anderson said. The National Park Service does not maintain a complete national database of parks that have cellular service, or which parks are considering applications from service providers or have equipment installation underway, according to Jeffrey Olson, public affairs officer for the National Park Service. As long as cell tower development fits within resource protection guidelines, individual national park superintendents are able to review and approve applications for new cell towers. He said the National Park Service will consider adding installing telecommunications equipment only in developed areas of national parks, but spillover of cell coverage into the backcountry is inevitable, Olson said. 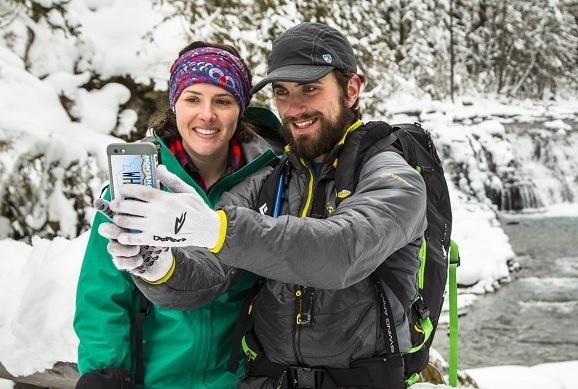 While some visitors to national parks seek solace and solitude away from cellular coverage, connectivity allows the park service to educate visitors during their visits, Olson said. Olson said the parks do receive complaints about cell towers’ visual impact. But Mount Rainier National Park is considering putting its new cellular equipment at Paradise inside an existing visitor lodge at the Jackson Visitor Center. The Park Service has prepared an environmental assessment that outlines the issuance of right-of-way permits to Verizon Wireless, T-Mobile and AT&T that would allow them to place their equipment in the visitor center. Meanwhile, in Yellowstone National Park, PEER is crying foul over the development of “ugly” cell towers on Mount Washburn, one of the most popular hiking destinations in Yellowstone, Ruch said. “Because it is one of the park’s highest points, telecom carriers covet it to project their signals as far as possible,” Ruch said. 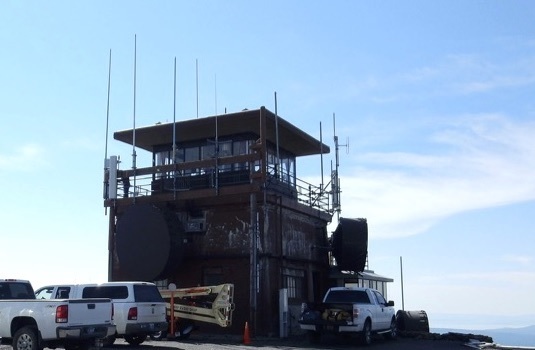 “Mount Washburn’s historic fire lookout has become Yellowstone’s electronic hub, festooned with at least 35 antennas and microwave dishes. The principal purpose is to facilitate the propagation of stronger next generation 4G cellular signals.